Only God really knows exactly how many churches will be necessary to fulfill the Great Commission in Japan. But if we look to mission experience and put our thinking caps on we can determine an effective goal for saturating Japan with churches. The number 50,000 has emerged from several sources and I have written that it “is serving as a rule of thumb for the dream toward a national church multiplication initiative moving forward. This initiative would be a broad-based evangelical movement for an ongoing focus of our energies toward the goal of Japan saturated with churches” (p. 159). But why are people considering 50,000 churches for Japan. 1. Churches would be “convenient” for all Japanese and could impact every neighborhood. “In discussions about reaching all of Japan by saturating each community with churches, some equate the number of churches required to the number of local post office banks serving residents throughout Japan” (page 159). “Several visionary Japanese leaders have advanced a target number of churches corresponding to the number of convenience stores in Japan. Convenience stores now total over forty-three thousand, which is closing in on one store per two thousand population. Convenience store chains have studied population trends and done marketing research to maximize sales among a specific population in a carefully defined geographical area. Considering the number and location of these convenient stores could be helpful in developing strategic church planting plans and providing convenient churches for the masses of Japan” (page 7). Convenient stores are positioned to serve every Japanese in a given community. 2. Churches would saturate all of Japan making the gospel readily available to every Japanese. Global missiologists consider sociology and population to develop practical guidelines for determining saturation of churches in a given population. They consider an area saturated when there would be one church for every 1,500 people. 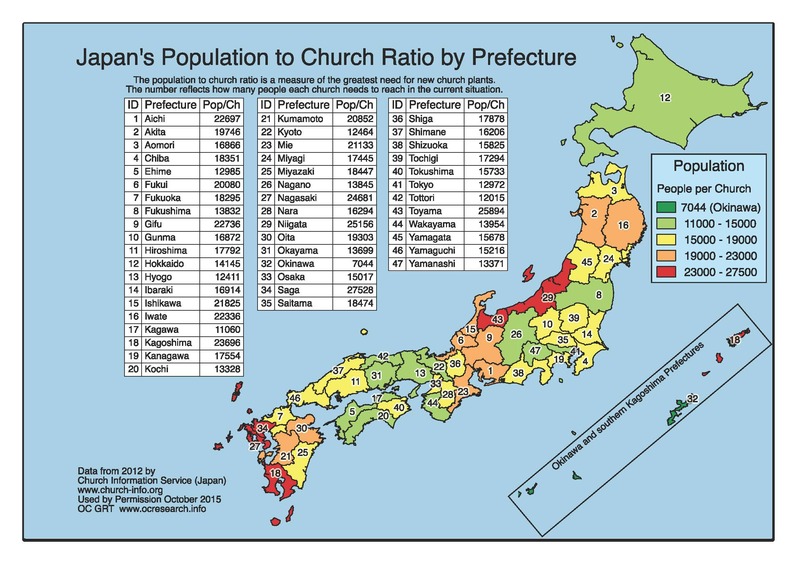 In urban societies like Japan probably a target of one church per 2,500 population would give sociological saturation. In view of the current population of 126 million people, Japan would need at minimum of fifty thousand churches (page 159). 3. The Christian percentage of population in Japan would exceed 2% leading to a sociological change agent. Scholars of religious movements understand that once a certain percentage join Christianity there is momentum that influences everyone in society making it easier for evangelism and establishing churches. Some feel this percentage only needs to just 2%. Christianity in Japan for many long decades has remained at only 1% of the population. Some visionary leaders in Japan envision 50,000 churches in Japan each averaging 50 people, so then the situation would exceed 2% of the population. So establishing 50,000 churches, breaking the 1% barrier, would lead to a likely social movement increasing the opportunity for multiplication. But is 50,000 a “magic number”? The number of 50,000 churches in not a magic number but a convenient rule of thumb when considering completion of the Great Commission in Japan. Of course, the goal would not be merely 50,000 churches but it would be hoped many more would be started. Current leadership in Japan is critically considering the barriers and obstacles and creative innovative ways to overcome. “Although Japan needs fifty thousand churches, and it must be done, with current human resources this task appears extremely difficult. The need for fifty thousand church planters raises many practical problems, not to mention the thousands of coaches and trainers it would entail to prepare and support them. But others, like the beginnings of the Holiness Church, faced very similar challenges and met them with bold, risk-taking faith and creative innovation. Furthermore, they fostered a vision that would sustain them not just to meet their goals but often to pass their set goals” (page 159-160). John Wm. Mehn, Multiplying Churches in Japanese Soil, William Carey Library, 2017.